Miami, OK (PRWEB) October 10, 2007 -- Running distinctly counter to industry trends, Newell Coach Corporation (http://www.NewellCoach.com) announced record-breaking sales of 42 Newell luxury motorhomes for the fiscal year ending June 30, 2007. Newell is increasing production to accommodate this unprecedented demand for both its new and late-model used luxury motorhomes. "As of October 1, we've ramped up to an annual rate of 44 new Newells," says company president, Karl Blade. "Our available new-coach inventory is currently zero, and our sold-order backlog extends well into next summer." 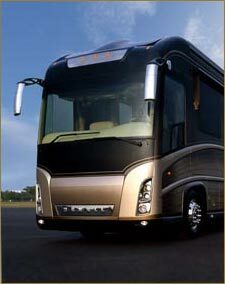 Blade credits the advanced, innovative nature of the Newell coach for the company's record-breaking sales. "We are unique in the $1 million-and-up sector of the luxury motorhome market," Blade says. "We manufacture our own custom body and chassis instead of using a commercial passenger bus shell. As a result, we can offer motorhomes with 625 bhp for superior performance." "Newell is also the only motorhome to feature a 12-speed automatic transmission manufactured in Germany by ZF," Blade continues. "And we are the only North American motorcoach company to incorporate a steering tag axle that gives our 45-foot coach an industry-leading 37-foot turning radius. This makes the Newell exceptionally easy to handle." Blade also credits the advanced exterior styling by Porsche Design for the coach's success. "Our customers appreciate the sleek, contemporary styling and quality of detail that are similar to a luxury automobile," says Blade. "Porsche has provided a fresh, attractive European look that has been exceptionally well received." According to Blade, the current year's success is a reflection of the steady but increasing demand for the Newell coach product. "We continue to build a largely custom product on a made-to-order basis," he says. "We are responding to this strong demand with a strategy of careful growth."